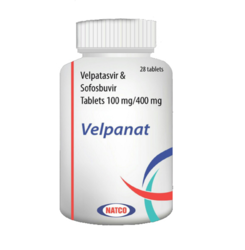 Our range of products include Hepatitis Drugs such as Hepcinat LP Medicine, Natdac (Daclatasvir 60 mg) - Natco Pharma, Resof (Sofosbuvir 400 mg), MyHep 400mg, SoviHep 400mg, Hepcvir 400 mg and many more items. We are recognized in the medical industry as a reputed organization, emerged in offering Hepcinat LP Medicine. Our offered medicine is formulated using finest quality chemical compounds and highly developed formulation methodology in compliance with all quality aspects prescribed by the market. To make sure quality and purity of the offered medicine, a team of our quality examiners with hard-earned knowledge in the industry verifies the entire range on different parameters. Keeping in mind the exact needs of clients, we are offering a quality range of Natdac (Daclatasvir 60 mg) - Natco Pharma. The offered medicine is formulated using finest quality pure chemical compounds and superior techniques as per set industry norms. The offered medicine is strictly tested against varied parameters of quality. Used for the treatment of hepatitis C (HCV), we offer this medicine as per the requirements of the customers at market leading prices. 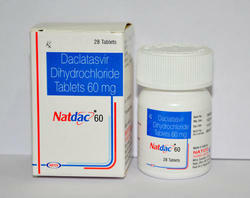 Natdac 60 mg or Daclatasvir 60 mg is a drug for the treatment of hepatitis C (HCV). 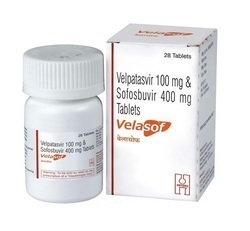 Daclatasvir should be combined with other medications, which may include other direct-acting antivirals that work differently – Sofosbuvir (Hepcinat or Resof). Daclatasvir is indicated for use by adults with chronic hepatitis C, meaning infection lasting more than six months. The major concern with drug interactions exists with medications that are strong inducers of intestinal P-up, such as rifampin and St. John's wort, since these compounds may significantly lower sofosbuvir and GS-331007 levels. 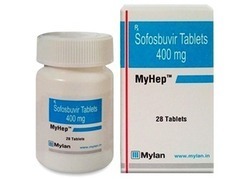 SoviHep 400mg (Sofosbuvir) is a nucleotide analog inhibitor of hepatitis C virus NS5B polymerase—the key enzyme mediating HCV RNA replication. 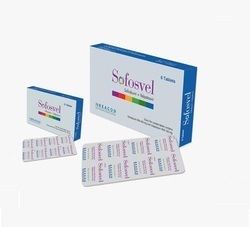 Sofosbuvir is a prodrug and after ingestion it is rapidly converted to GS-331007, the predominant circulating drug that accounts for greater than 90% of the systemically active drug. The compound GS-331007 is efficiently taken up by hepatocytes, whereby cellular kinases convert GS-331007 to its pharmacologically active uridine analog 5’-triphosphate form (GS-461203). This triphosphate compound mimics the natural cellular uridine nucleotide and is incorporated by the HCV RNA polymerase into the elongating RNA primer strand, resulting in chain termination. The active form GS-461203 targets the NS5B catalytic site and acts as a non-obligate chain terminator. The active compound (GS-461203) does not inhibit host DNA polymerases, RNA polymerases, or mitochondrial RNA polymerase. 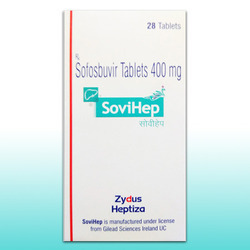 SoviHep 400mg is available as a 400 mg tablet. The recommended dose of sofosbuvir is 400 mg taken orally once daily, with or without food. The 400 mg dose of sofosbuvir should be used, regardless of the patient's genotype and prior hepatitis C treatment experience. No dose adjustment is needed for mild-to-moderate renal impairment or with mild, moderate, or severe hepatic impairment. SoviHep 400mg has been very well-tolerated in clinical trial. The most common adverse effects observed with sofosbuvir, when used in combination with ribavirin, have been fatigue and headache. Sofosbuvir is pregnancy category B. The major concern with drug interactions exists with medications that are strong inducers of intestinal P-gp, such as rifampin and St. John's wort, since these compounds may significantly lower sofosbuvir and GS-331007 levels. The coadministration of sofosbuvir with the following medications is not recommended because these medications may significantly lower sofosbuvir levels. 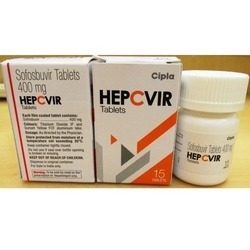 Hepcvir 400mg (Sofosbuvir) is a nucleotide analog inhibitor of hepatitis C virus NS5B polymerase—the key enzyme mediating HCV RNA replication. Sofosbuvir is a prodrug and after ingestion it is rapidly converted to GS-331007, the predominant circulating drug that accounts for greater than 90% of the systemically active drug. The compound GS-331007 is efficiently taken up by hepatocytes, whereby cellular kinases convert GS-331007 to its pharmacological active uridine analog 5’-triphosphate form (GS-461203). This triphosphate compound mimics the natural cellular uridine nucleotide and is incorporated by the HCV RNA polymerase into the elongating RNA primer strand, resulting in chain termination. The active form GS-461203 targets the NS5B catalytic site and acts as a non-obligate chain terminator. The active compound (GS-461203) does not inhibit host DNA polymerases, RNA polymerases, or mitochondrial RNA polymerase. 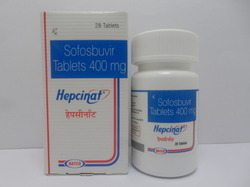 Hepcinat 400mg (Sofosbuvir) is a nucleotide analog inhibitor of hepatitis C virus NS5B polymerase—the key enzyme mediating HCV RNA replication. Sofosbuvir is a prodrug and after ingestion it is rapidly converted to GS-331007, the predominant circulating drug that accounts for greater than 90% of the systemically active drug. The compound GS-331007 is efficiently taken up by hepatocytes, whereby cellular kinases convert GS-331007 to its pharmacologically active uridine analog 5’-triphosphate form (GS-461203). This triphosphate compound mimics the natural cellular uridine nucleotide and is incorporated by the HCV RNA polymerase into the elongating RNA primer strand, resulting in chain termination. The active form GS-461203 targets the NS5B catalytic site and acts as a non-obligate chain terminator. The active compound (GS-461203) does not inhibit host DNA polymerases, RNA polymerases, or mitochondrial RNA polymerase. Hepcinat is available as a 400 mg tablet. The recommended dose of sofosbuvir is 400 mg taken orally once daily, with or without food. 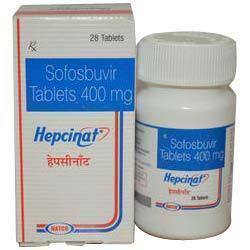 The 400 mg dose of sofosbuvir should be used, regardless of the patient's genotype and prior hepatitis C treatment experience. No dose adjustment is needed for mild-to-moderate renal impairment or with mild, moderate, or severe hepatic impairment. Hepcinat has been very well-tolerated in clinical trial. The most common adverse effects observed with sofosbuvir, when used in combination with ribavirin, have been fatigue and headache. Sofosbuvir is pregnancy category B. .The offered products are provided to our valued clients in various packaging options. These products are highly used for the treatment of hepatitis C. Offered products are developed by utilizing optimum quality ingredients and advanced technology in line with medical industry defined standards. Furthermore, offered products are delivered within committed time limit to ensure clients' production process is not delayed. We are actively Exporter of Ledipasvir.The offered products are provided to our valued clients in various packaging options. These products are highly used for the treatment of hepatitis C. Offered products are developed by utilizing optimum quality ingredients and advanced technology in line with medical industry defined standards. Furthermore, offered products are delivered within committed time limit to ensure clients' production process is not delayed. 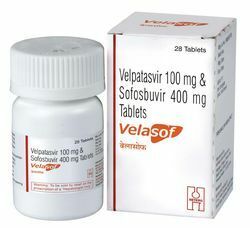 Velasof medication is a combination of sofosbuvir and velpatasvir. This drug work by reducing the amount of hepatitis C virus in your body, which helps your immune system fight the infection and may help your liver recover. 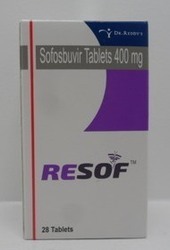 Our company is actively committed towards offering the most sought range of Resof (Sofosbuvir 400 mg). It is a recommended treatment option in the WHO’s first hepatitis C treatment guidelines. The offered medicine offered by us is extensively appreciated for their zero side effects and exact composition. Offered medicine is formulated from finest quality chemical compounds with industry accepted norms of quality. Provided medicine is tested by quality experts against varied quality parameters to ensure the delivery of flaw free range. Sofosbuvir, used in combination with other drugs, has been successful to achieve high cure rates at the same time shortening the duration of the treatment to as little as 12 weeks. It is a recommended treatment option in the WHO’s first hepatitis C treatment guidelines. Resof will allow a patient suffering from chronic Hepatitis C access to a “more affordable and effective treatment regimen as compared to other drugs.